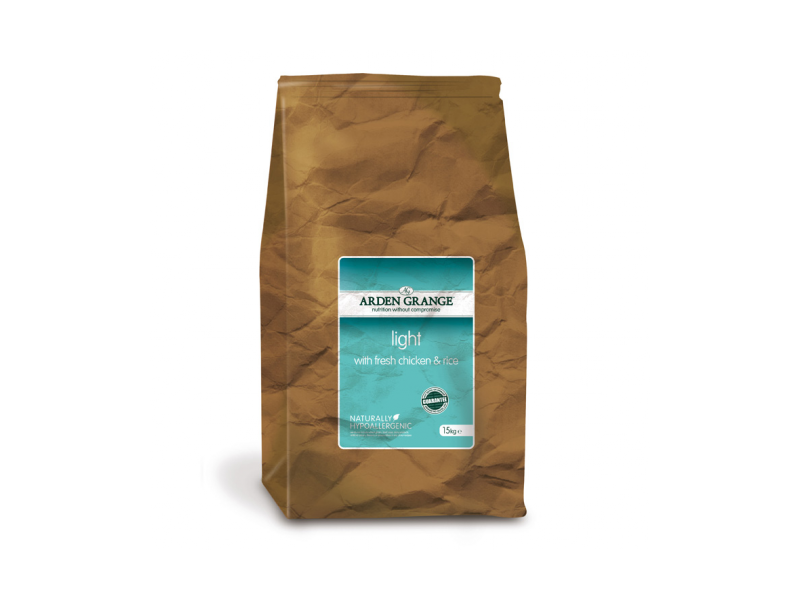 Arden Grange Light With Fresh Chicken & Rice is a specially formulated diet for overweight dogs, or those with a tendency to gain weight. The recipe contains advanced fibres to help your dog feel satisfied for longer and has a reduced fat and calorie content to aid weight management, whilst not compromising on quality or taste. Added L-carnitin will increase the conversion rate of fat to energy, reducing fat storage that can be detrimental to the health and mobility of your dog. Crude Protein 18%, Fat Content 7.5%, Crude Ash 6%, Crude Fibres 3.5%, Calcium .09%, Phosphorous 0.6%, Omega-3 0.46%, Omega-6 1.63%, L-carnitine (50mg/kg). Below are some recent questions we've received regarding Arden Grange Light With Fresh Chicken & Rice Dog Food, including answers from our team. I used to feed my dogs (golden retriever 7 and Cavalier king Charles 4) on Arden Grange Light. Swapped to Adult AG, as felt retriever needed more in her food, but they are both putting on weight. Is it ok for retriever to be kept on the light mix in view of her age and will she get enough out of her food. The light version would certainly be better if weight control is needed. The food contains everything your dogs need. If she is gaining weight, she is clearly getting too much from her food at the moment, and putting the spare energy into storage. Ultimately that can have lots of health implications and you should certainly try to control it if you can. Older dogs do well on light-type diets generally in fact because they tend to have a more "senior" profile of ingredients.